Holden Beach - Premium Moving, Inc.Premium Moving, Inc.
Benjamin Holden in 1756 bought four mainland tracts and the island between his plantation and the ocean. This island extended from Lockwood’s Folly Inlet west 6 miles (10 km) to Bacon Inlet. Benjamin and his sons used the island for fishing and cattle grazing. During the Civil War Holden Beach and Lockwood’s Folley Inlet became the resting place of several shipwrecks: the Confederate blockade runners CSS Elizabeth and CSS Bendigo and the Union blockade ship USS Iron Age. The remains of the Iron Age can be seen on the eastern end of the island during the periods of low tide. Its wreck is marked with an orange navigation warning buoy and is located between Holden Beach and Oak Island. While the vessel’s wreck is roughly 200 feet (61 m) long, only the base of the engine’s exhaust funnel and a small portion of superstructure are visible above water. The ship is easily reached during low tide by swimming, but the wreck is extensively covered in abandoned fishing hooks and gear that may present potential hazards. John Holden, Benjamin’s grandson, started a commercial fishery on the island and in 1924 surveyed a section which he called Holden Beach Resort, the plat of which represented the first subdivision of beach property in Brunswick County. In 1925, he built the Holden Beach bridge; it was subsequently destroyed by the Inland Waterway construction. “Mr. Johnny” negotiated with the state of North Carolina for the institution of a public ferry to reach the island, but he did not live to see the ferry begin operation in 1934. Luther S. Holden, John’s son, operated the old hotel that his father had built, started development of the property nearby and became a permanent resident in 1946. Soon afterwards, Luther S. Holden’s son (John F. Holden) began building other homes and renting them to vacationers. A bit later, other smaller developments were started west of the ferry location. In the early 1940s one could buy an oceanfront house with the land for about $600. John F. Holden and his wife Johnsie actually began the development of Holden Beach that would slowly become a resort area. The Holdens had two sons, Lyn and J. Alan Holden, the seventh generation of Holdens to live on Holden Beach. In 1954, the island had about 300 homes and a turnbridge. After that year’s destructive Hurricane Hazel, which hit on Oct. 15, 1954, the rebuilding was slow. 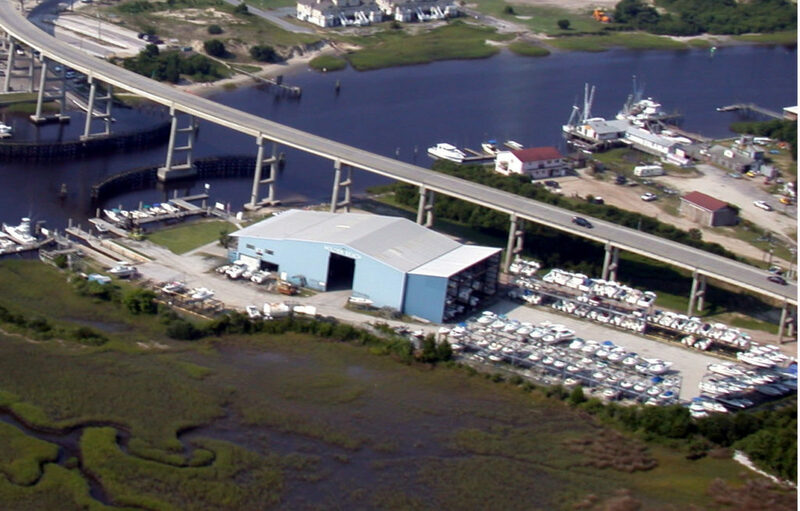 On February 14, 1969, the island was incorporated, and on May 13, 1986, the Town of Holden Beach dedicated a new high-rise steel and concrete bridge, allowing better access to the more than 1,900 homes on the island. The one church on the island, the interdenominational Holden Beach Chapel, began as a Bible study in the home of Luther S. Holden and several other resident families on the island. Eventually land was donated and the church was erected in the 1940s. It was destroyed by Hurricane Hazel in 1954 but was rebuilt shortly thereafter. Today the chapel serves the many hundreds who live on and around Holden Beach and the numbers of visitors who vacation on the island during the summer months.